Why is My Chimney Pulling Away From My House? Home > Blog > Why is My Chimney Pulling Away From My House? Is Your Chimney Pulling Away From Your Home? Driving past your house or standing in your front yard, you catch an alarming glance and notice that your chimney is pulling away from your house. Immediately, you imagine the worst of the worst, because as a veteran homeowner (or even a novice, first-time homeowner), you know that when things aren’t aligned structurally in your home, it’s never a good sign. Before you panic, realize that a leaning chimney is not the end of the world, but it’s a pertinent problem that should be prioritized for a timely solution. A leaning chimney happens to the best of homes and is often a product of time aging the home. While it may seem as if your entire house is quite literally falling apart, these things can be fixed without the need to dismantle the structure brick for brick. There are multiple factors that could be responsible for causing your chimney to shift away from your home. Structures that are guilty of doing this usually are victim to more than one variable at play. Chimneys are not exactly light—in fact, they weigh tons. This concentration of weight in a small, pillar-shaped area must be constructed in such a manner to meet today’s standards. As a homeowner, you are likely wondering if there are any preventative methods in keeping your chimney in place, or if there was something you could have done to stop it from leaning. Sometimes, the simple answer is that the aging of the house and the surrounding foundation adheres to the outside elements, and you can take solace in not being able to control such factors. Midwesterners are familiar with the freezing cold winters complemented by the seasonally opposing blazing hot summer, and these weather shifts and temperature drops have a hand in damaging homes and their structures. Concrete falls victim to temperamental weather and has a tendency to crack because of it. Freeze and thaw cycles trap moisture in the base, which can lead to quicker deterioration. There’s no telling what occurred when the chimney was initially built. Today’s guidelines in chimney construction are rigorously implemented, but depending on who constructed your chimney and when this may not have been the case. Chimneys are built to handle the heat and flames of a fireplace, and because of this, are built thick and heavy to withstand these harsh elements. If certain guidelines are ignored in building a chimney, then you will soon see tilting due to its poor design. An older home may have a few missteps in construction or could have been faced with the elements of age that eroded what was once a solidly built chimney to one that is slowly deteriorating. For a homeowner, this could mean the footing of the chimney is too small to bear its weight, or perhaps the time has taken a toll on the base, the most important part of the chimney. A sturdily constructed footing for the chimney must be one foot thick and extend six inches on each side. The footing allows for stability in the structure and prevents it from leaning away from the house. Water is the enemy of any foundation, even one that is newly built. When moisture is present, it can work its way into cracks and crevices, weakening a structure from the inside and out. A chimney is no exception to the water’s path of least resistance, and one way or another, the soil and moisture around the chimney’s base is going to wreak havoc on its structural integrity. Of course, this doesn’t happen overnight; it takes years for the surrounding landscaping and soil to loosen at the base, causing a visible shift. And there are some types of soil that simply cannot hold the weight of these hefty chimneys. Too loose of the soil will cause shifting of the chimney’s base, resulting in the tilting that you can see above the ground. How Can I Be Sure the Chimney is Pulling Away from The House? 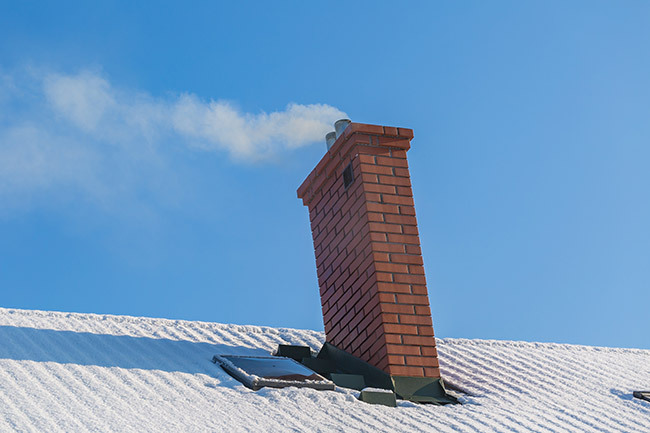 You may wonder if, in fact, your chimney is suffering from this problem, and a visual inspection from the outside of your home leaves you with an ambiguous answer to this question. After all, you don’t want to wait until the chimney replicates the Leaning Tower of Pisa before doing something about the problem. There are a few clues to inspecting a chimney to see if it’s tilting. It can be difficult to tell in some cases, especially if a previous attempt has been made to remedy the chimney’s angling away from the house. Previous homeowners may have realized that the chimney was pulling away from the house, but may have neglected to reconstruct it properly due to monetary constraints. A common and cheaper temporary fix that could have been done to hold the chimney in place is to fill the gap between the leaning chimney and main house structure with mortar or some type of caulking or expanding foam insulation. The chimney could also be fastened into place with metal straps. While all of these methods are cheaper than reconstructing the chimney, they are not a permanent solution. Another indication that the chimney is tilting is when the flashing on the roof has become dislodged. The chimney may have settled because of the instability of the foundation. The horizontal mortar joints will be a good starting place to check to see if your chimney is leaning. You can also use a leveler, or head up to the attic to see if the chimney is centered on its opening. A chimney pulling away from your house can eventually be taken over by gravity, and at this point, be a danger to anyone with the unfortunate presence of when this occurs, or cause thousands of dollars of property damage. You don’t want to let this problem be at a standstill, and you especially do not want to put into place temporary fixes that may not be effective or last. In the situation of a chimney pulling away from the house, there are numerous problems that could arise. If you are an avid fireplace user, imagine the potential hazards a leaning chimney could procure if a fire is lit and the billowing smoke has no direct path for an exit. There is also the obvious problem of the chimney collapsing because of the lack of support, which causes physical injuries to anyone in the path of destruction. Solving your leaning chimney problem will take an experienced chimney and masonry professional. While this is not a cheap solution, it’s the most effective and guaranteed to be the safest. 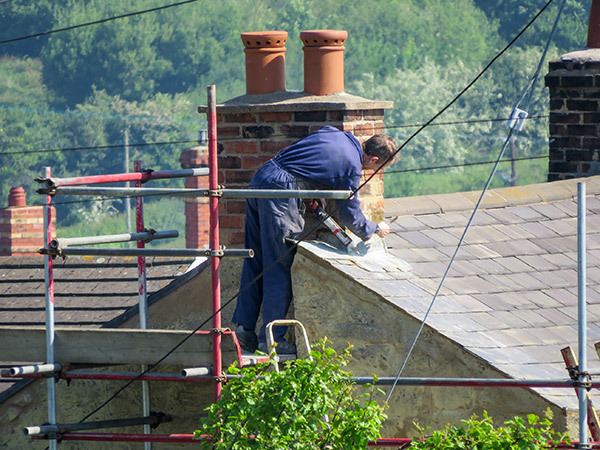 With today’s technology and construction innovations, repairing a chimney is not as costly as you may think, but it will be a bigger investment than relying on flimsy metal straps to anchor your chimney in place. Many chimney professionals offer free quotes for the repairs needed. It’s recommended that you obtain a few quotes from at least three different companies, if possible. Chimney Pulling Away from House? Keep your property safe and repair your chimney today. Early Times is the most trusted chimney service company in Chicago and suburbs since 1985. Speak to a specialist and get a free quote now.